Shows. Classes. Workshops. Other happenings. The Bead & Button Show is a 13-day jewelry-makers event in Milwaukee, Wisconsin. There are exhibits, demos, author events, a gigantic marketplace, and nearly 700 classes. Online registration opens January 3, 2017. ImpressArt Presents: Powder-Coating Party! Six hours this year! Two sessions available. ​Description: Join two former editors from Art Jewelry magazine to learn about the latest jewelry-making trend in this playful, crash course in powder coating. 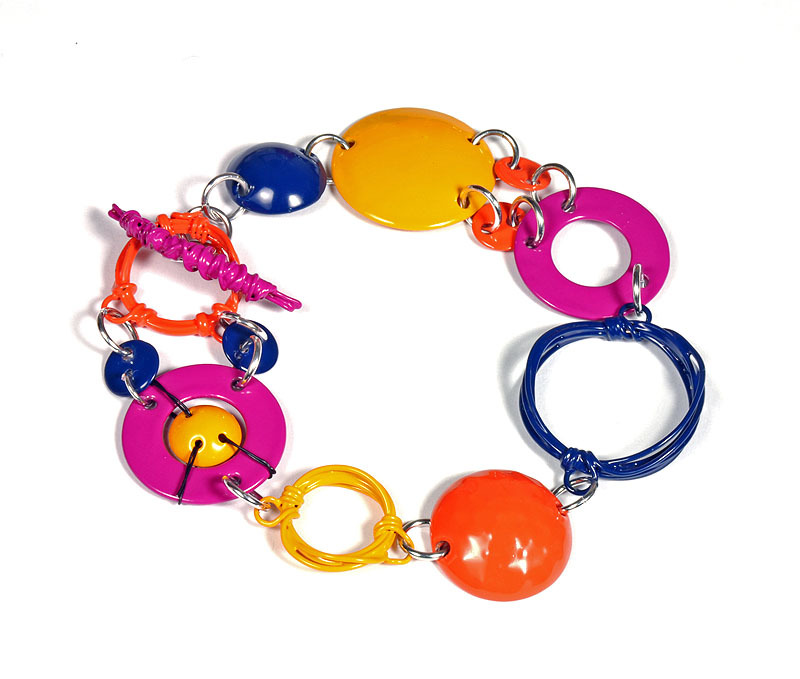 Using a simplified coating process of dipping instead of spraying the powder coat, you will learn how to prepare the metal blanks, apply the powder, and cure the finished pieces to create a colorful bracelet, necklace, or an assortment of components to use in your jewelry designs. Students will Learn: Learn how to easily add color and a durable protective finish to your metal components; how to safely and simply (and inexpensively) incorporate this industrial coating process into your home jewelry studios with minimal tools, supplies, and mess. Preview the classes HERE starting on Tuesday, December 20. Class is available for purchase on Tuesday, January 3.
teardrop-shaped earrings that combine metal sheet and wire forming and forging with the simple technique of applying colored pencil to metal—the techniques learned can easily be applied to your own designs. and sheet, drill holes through metal, make ear wires, and apply and selectively remove a patina to highlight the details of the metal. Preview the class HERE starting on Tuesday, December 20. Class is available for purchase on Tuesday, January 3.
me of fish ribs) with only one material — over a yard of silver wire! They’re fun to make and even more fun to wear, and while the steps and techniques you'll learn are simple, it requires patience and perseverance to finish each component properly. Students Will Learn: Students will learn the benefit and importance of assembly-line production techniques when making multiple-component jewelry, including properly finishing all components to a certain point before moving on to the nextstep. They’ll learn how to forge and form wire, proper plier techniques, how to make a variety of ear wires, finishing techniques (including filing and sanding by hand), and patina application. Description: Learn how to create an assortment (up to three pairs) of trendy ear jackets—an earring style with interchangeable elements that can be worn in front of or behind the ear lobe. Using sterling silver in a variety of sheet and wire forms, discover how fun it is to make earrings that can be worn in more than one way! Students Will Learn: In addition to learning about basic ear jacket requirements, students will learn how to create simple post earrings, make and cut jump rings, simple silver soldering and clean-up, texturing metal, and how to use a variety of wire and metalworking tools. The class will begin with a series of demos, and then students can take what they’ve learned and make up to three styles of ear jackets with matching post earrings—if you make three styles of post earrings and three styles of jacket components, that’s up to 21 different ways you can wear these earrings!